PYPL will ride the integration of payments into merchant pay-and-save apps, for use by consumers both online and offline, to 25% volume growth for the foreseeable future. Mobile payments, almost entirely online today, represent 25-30% of PYPL’s volumes and are growing at 45% annually, and PYPL is on the cusp of penetrating the offline market accounting for ~90% of global retail sales of $25tn. The extension of the PayPal brand from online to offline requires that the acquiring processors who handle merchant payments accept the firm’s tokens and we view the January announcement that First Data will do so as a strategic watershed. The future of mobile payments lies not with mere changes in form-factor, such as Apple Pay, replacing a card swipe with a phone tap, but with merchant pay-and-save apps such as Walmart Pay and CurrentC which add value to consumers by transforming the entire checkout experience including integration into the payments stream of digital receipts and the earn-and-burn of loyalty rewards/coupons and add value to merchants by improving the effectiveness of marketing and trade-spend. Through its Braintree and Paydiant operations, PayPal can provide back-end support (such as gateway and token services, for example) to these merchant apps and, as CFO John Rainey explains, “where we do back-end processing it allows us to have the presentment of PayPal as a form of payment”. The pitch to merchants is that this then allows advantaged access to the consumer franchises associated with the PayPal and, if the merchant chooses, Venmo brands. Indeed, these consumer-facing franchises are a key advantage to Braintree in its duopoly competition with Stripe to payments-enable merchant apps. Both banks and card networks are responding to PayPal’s expansion to the offline market, the former by looking to re-assert control over the payments value chain through the clearXchange (CX) network and the latter through competing buy-buttons, such as Visa Checkout, and rhetoric. PYPL’s plans to extend its Venmo brand from P2P to POS for app-based payments is a particular concern because of its rapid growth; Venmo will likely handle $15bn of P2P payments in 2016, after a year-on-year increase of 200% in January to $1bn, closing in on BAC and JPM which each handled ~$20bn in 2015. Bank Response: Earlier this month, BAC and USB launched real-time P2P payments over the CX network to match the real-time capabilities of Venmo and versus the typical settlement period of 2-3 days for existing P2P bank services. We expect the other bank owners of CX (JPM, WFC, PNC, BBT, and COF) to follow suit and for CX to extend capabilities to non-owner banks through interoperability with the P2P networks of FIS and FISV (which can support real-time settlement because of tight integration with the checking account systems of bank customers). We also expect CX to extend its capability from P2P to POS allowing banks to regain some control of the payments value chain from V and MA. Network Response: In clear reference to PayPal, Visa CEO Charlie Scharf has commented “people that generate business for us in the short term, whose business model is built around disintermediating eventually us and our clients, is not something that we like, not something that we support, and not something that we’re just going to sit idly by and watch”. However, PYPL is a large customer of the networks and attempts to shape its behavior through raising fees (as in the case of the MasterCard “staged digital wallet operator fee”) increase the incentive for the firm to steer transactions to alternatives such as PayPal Credit and ACH debit while attempts to discourage steering with lower fees reduces the ability of the networks to keep issuing banks in line with interchange and likely accelerates the extension of CX from P2P to POS. As network rhetoric heated up, PYPL looked to provide reassurance that it will not actively steer payments to alternative tenders such as PayPal Credit and ACH debit but rather allow customers to use whichever tender they prefer. This is a sop first because customers using PayPal credit spend 25-30% more than the average PayPal customer (and so improve PayPal’s direct economics and value proposition to merchants) and second because PayPal cannot meet its medium-term guidance for stable or better operating margins without reducing its “funding rate” (representing the fees paid to the card networks as a percentage, 0.93% in 2015, of payment volumes); this, in turn, requires shifting the funding mix away from the branded networks. 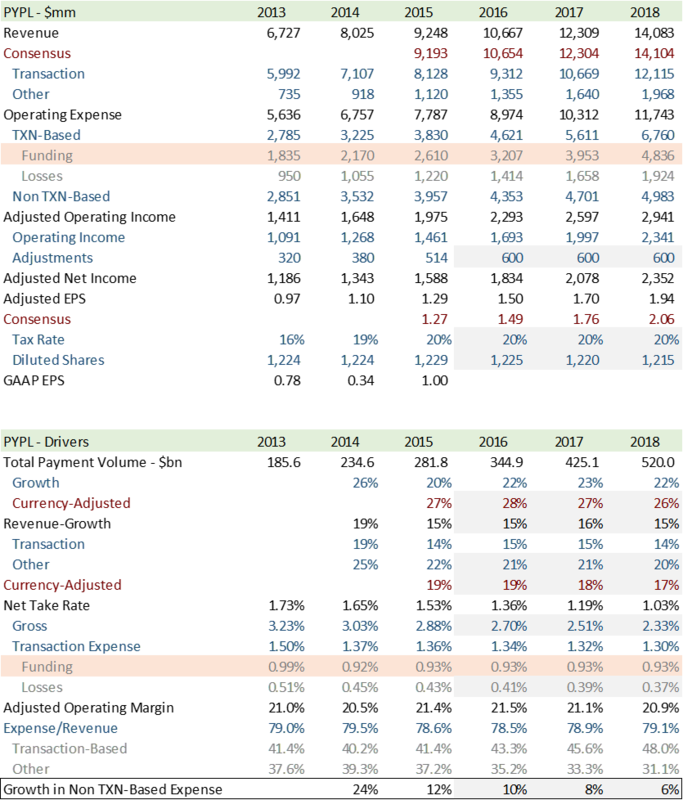 PYPL argues, correctly in 2015, that it can improve operating margins through containing non-variable costs to offset the decline in the take rate (representing transaction-based fees paid by merchants as a percentage, 2.88% in 2015, of payment volumes) as PYPL extends its brand to large merchants and integrates acquired brands such as Venmo and Xoom. However, the approach is self-defeating since, as these non-variable costs decline in the expense-mix from the current 50%, there is less leverage from their containment and it becomes necessary to reduce transaction-based costs. These transaction-based costs split 2:1 between the funding rate and the loss rate (arising from fraud and credit losses) making reductions in the funding rate a necessity. Indeed, without reductions in the funding rate under our model, PYPL would need to hold growth in non-variable expenses to below 6% (versus 12% in 2015) to meet guidance for the operating margin; we do not believe this is achievable. Globally, mobile purchase volumes are forecast to increase to $1tn globally in 2017 from less than $500bn in 2015; this will be driven by shifts in online purchase behavior with the offline market, accounting for ~90% of retail sales of ~$25tn, important to longer-run growth. At PYPL, mobile payments accounted for ~one-quarter of PayPal’s total payment volume of $82bn in FY2015Q4 and grew 45%. Mobile will drive firm-wide payment volume growth of ~25% for the foreseeable future as consumer purchases shift to app (including social media networks) from browser in the online channel and from plastic card in the offline channel. The consumer shift to mobile payments is not driven by simple substitution of form-factor (from card to phone) because the card swipe works well enough, but by the opportunity provided by merchant apps to create a convenience benefit through integrating payments into broader path through purchase including checkout in particular. PYPL CFO John Rainey draws this distinction when he says “[Apple Pay] is a form factor change; it does not change the value proposition to the customer … when you think about your top ten pain points at checkout pulling out a credit card is not that difficult … what we are doing is following the customer with the mobile device”. Given the consumer shift mobile purchases and PYPL’s compelling advantages in the space, we see the challenge for the company less in meeting targets for growth in payment volumes but more in maintaining operating margins as the firm becomes increasingly relevant to large merchants particularly with the expected launch of the CurrentC payment brand from the retailer consortium, merchant customer exchange or MCX, later this year. After looking at the drivers of mobile payments volume, this note explores the margin challenges in the context of PayPal’s relationship with the branded card networks and with the banks. For many merchants, payments are not an early use-case for apps. WMT, for example, launched its app in November 2011 to provide consumers with shopping tools including smart shopping lists and access to manufacturer coupons; since then, the app-capabilities have been extended to include in-store navigation and support for the savings-catcher program (guaranteeing consumers who use the phone-camera to upload a receipt-image the lowest price versus local competition). It is only in December last year that the firm announced it would be adding payments capability to the app with Walmart Pay. However, we expect pay-and-save apps to become the norm because of the data-benefits to merchants. Specifically, the ability of payments-enabled merchant apps to aggregate the personally-identifying information (PII) of a customer with point-of-sale (POS) scan information is a transformational change from traditional payments where these data are bifurcated: the tender-issuing bank knows the personal details of the customer while the merchant sees only the card number and cannot map that to a name or e-mail address unless the customer is enrolled in a loyalty program and uses it for the transaction; and the tender-accepting merchant has the POS scan information while the bank sees only the basket-level information (i.e. the total value of the checkout amount without visibility into the “in-basket” SKU-level items). PYPL CEO Dan Schulman has referenced the different with his remark that “data is the weapon” and we agree that the impact of data strategy on retailing will be as transformative offline, once app-based shopping make them available to merchants, as it has been online. For example, manufacturers complain that trade-spend (provided by manufacturers to retailers to support branded product and amounting to ~15% of revenues at consumer-packaged-goods or CPG companies) is ineffective because they cannot associate the POS-scans of promoted product to the PII of a customer and hence cannot tell whether a promotion has attracted an incremental sale or simply provided a windfall discount on a purchase that would have been made in the normal course. The personally-identifying information (“PII”) is not available on a typical card purchase (since the merchant sees only the card number and, unless a customer uses a loyalty program, cannot identify that with a name or e-mail address) and the point-of-sale (“POS”) scan information (peering inside the consumer basket to see individual SKU-level items) is not available to competing payment providers, such as Visa through Visa Checkout, since it is accessible only to the merchant. Retailers that can support manufacturers in improving the efficiency of trade-spend, including by providing PII+POS scan data, will likely gain an increasing share of this trade-spend and hence competitive advantage. The amounts are significant since in the US annual trade-spend runs at $200bn versus $60bn in the interchange-receipts to banks available to fund rewards on bank-issued tender, and provide an additional incentive for merchants to introduce payments-enabled apps and steer consumers towards their use for payment. In particular, we believe an important part of the business case for Walmart Pay is generating PII+POS scan data to fee to Walmart Exchange or WMX which a play to apply big data to improving the effectiveness not only of its own marketing spend but also that of its vendors. PayPal has secured an early-mover advantage in the business of payments-enabling merchant apps through two acquisitions – that of Braintree in September 2013 and that of Paydiant in May 2015. PayPal’s Braintree is catalyzing the online shift of purchase volume to apps in a duopoly with Stripe over which it has a defining competitive advantage: Stripe is not able to enable apps for PayPal-branded payments and hence PayPal’s 180mm active customers. PayPal’s Paydiant is catalyzing the offline shift of purchase volume to apps through integrating payments into other app services, such as order-ahead and save-your-history (no need to re-enter your sandwich toppings at Subway, for example), improving consumer convenience. Competing mobile platforms, such as OS-enabled payments (e.g. Apple Pay and Android Pay) and checkout buttons (e.g. Visa Checkout and Amazon Pay) cannot generate the same consumer value proposition as PayPal. As a first example, Visa Checkout, like PayPal, improves conversion rates for app and browser purchases by obviating the tiresome need for consumers to enter card numbers at checkout. Specifically, Visa reports customers enrolled in Visa Checkout completed 69% of transactions from the shopping card versus a comparable conversion rate of 63% for customers enrolled in PayPal Express. PYPL responds that its One-Touch technology (now deployed to ~10% of PayPal consumers and allowing them to skip the PayPal log-in screen) increases conversion rates by 50% which, assuming base conversion for mobile checkout of 40%, would raise absolute conversion to 80%. As a second example, Apple Pay is simply a form-factor substitute (phone for card) and, with initial novelty now wearing off, has seen eligible usage decline by 20%+ over the last year. In practice, it is the integration of payments into the broader path through purchase including checkout activities (e.g. the earn-and-burn of loyalty rewards/coupons and the building of a digital record of purchases) that adds value not the mere replacement of card-swipe. The merchant customer exchange, MCX, is focused on this broader checkout experience and the launch of its CurrentC app later this year will boost PayPal volumes because Paydiant is a strategic partner of the retailer consortium and merchant use of PayPal’s white-label services (such as Paydiant’s token service and Braintree’s gateway service) increases the chance the merchant will present the PayPal brand in its payments menu. CFO John Rainey explains, “where we do back-end processing it allows us to have the presentment of PayPal as form of payment” with the pitch to the merchant that this can improve sales in-store as it does online: CEO Dan Schulman quantified this improvement in February remarking that “merchants who put PayPal on see about a 16% lift in sales”. More generally, through Braintree and Paydiant, PayPal is driving a deep change in the competitive dynamic of payments. Traditionally, consumer payment preferences have been shaped by bank rewards schemes with merchants sidelined because of the risk of lost sales arising from non-acceptance of a customer’s preferred choice of bank-issued tender. PayPal is changing this by enabling merchants to shape consumer tender preferences through integrating payments with merchant-issued apps offering both a financial reward (e.g. via loyalty rewards and coupons) and a convenience benefit (e.g. contextual commerce online and order-ahead offline). Furthermore, there is a flywheel effect since, as more consumers use pay-and-save merchant apps, merchants generate a deepening PII+POS-scan dataset that can inform decisions on how to target real-time offers to individual consumers and how to shape tender-preferences through a mix of these financial rewards and convenience benefits. Beyond (constant-currency) growth of ~25% in payment volumes, PYPL’s medium-term guidance calls for ~15% revenue growth and stable-to-increasing operating margins. The gap between growth in volume and revenues is largely explained by the extension of the PYPL brand to larger merchants from the smaller merchants in a nice example of Christensenian disruption. The trend is already in evidence as PYPL’s the “take rate”, representing the ratio of transaction-based revenue to payment volume, has declined from 3.23% in 2013 to 2.88% in 2015 given that larger merchants expect volume-based pricing. At first glance, the guidance for stable-to-rising operating margins seems intuitive: there should be supply-side economies of scale as payments volumes grow over an IP-enabled infrastructure and at-scale customer service organization, and the increase in (adjusted) operating margin to 21.4% in 2015 from 20.5% in 2014 appears to validate this thesis. However, approximately one-half of PYPL’s operating expenses are variable and tied to payment volumes which limits operating leverage particularly as the average take-rate declines. The largest component of these variable expenses comprises the fees, including interchange, paid to the Visa and MasterCard network that PYPL refers to as transaction-funding costs; in 2015, these amounted to 0.93% of payment volume or over double the amount arising from fraud and credit losses (Chart 1). PYPL CFO John Rainey insists that “we are containing the cost growth in non-volume-related areas in a way that can mute the impact of the decline in unit revenue [i.e. the take rate]” so as to “keep that [operating] margin flat to growing”. However, assuming no decline in the transaction funding and loss rates (as a percentage of payment volumes) this will become increasingly difficult over time as these transaction-based components become larger in the expense-mix relative to the non-transaction based components and, of course, eventually it becomes impossible. Even by 2018, PYPL would have to hold growth in non-transaction based expenses to below 6% (compared with 12% in 2015 – Chart 1 above) to keep the adjusted operating margin at ~21%. The inescapable conclusion is that stable operating margins will require PYPL to offset declines in the take rate through lowering the funding and loss rates currently standing at 0.93% and 0.43% of payment volumes respectively. As illustrated in Chart 1, we allow for the loss rate to continue to decline at 2 basis points annually, as it did in 2015, on the thesis that improved authorization technology will reduce fraud losses by more than expanding credit losses on PayPal Credit. Nonetheless, failure to reduce the funding rate is inconsistent with guidance for the stable operating margin even under aggressive assumptions for containment of non-transaction based expenses. This is strategically significant because the funding rate is the hinge on which turns the relationship between PYPL on the one hand and the branded card-networks, such as Visa and MasterCard, on the other. Approximately one-half of PYPL transactions are funded through the branded card-networks and one-half through other sources being ACH-based debit, PYPL credit, and prepaid balances in PYPL wallets. Given the funding rate on these other sources is effectively zero, the natural course for PYPL to reduce its aggregate funding rate is to shift the funding mix from the card brands and, in the past, the firm has made it marginally more difficult for customer to enroll, say, a Visa credit card than a bank checking account for ACH-enabled debit. However, this steering represents a threat to the networks who have become more outspoken about it as PYPL looks to extend its franchise from online to offline payments. V CEO Charlie Scharf expressed his views forcefully in January: “People that generate business for us in the short term, whose business model is built around disintermediating eventually and our clients, is not something that we like, not something that we support, and not something that we’re just going to sit idly by and watch”. PYPL has responded by presenting a tender-neutral strategy and emphasizing that it wants customers to pay in the tender of their preference and, indeed, the recent versions of the PayPal wallet makes it as easy to enroll a Visa card as a bank checking account. However, this is a sop since the firm’s economics and guidance depend crucially on managing down the funding rate so that either Visa and MasterCard have to reduce their prices to PayPal or PayPal has to shift its funding mix to less expensive tenders by shaping customer preferences. As a result, MA CEO Ajay Banga is properly skeptical of tender-neutrality at PYPL noting in March that “they are steering to ACH just to irritate me even more”. Furthermore, in the specific case of PayPal credit, PYPL has an additional incentive to enroll customers in the tender because, as CFO John Rainey comments, “we use credit because of the flywheel effect in that when we issue credit to a customer we see that that customer will spend 25-30% more than the average PayPal customer”. The customer transition to mobile payments makes it meaningfully easier for PayPal to steer customers to private-label credit (i.e. PayPal credit in this case) from network-branded credit. 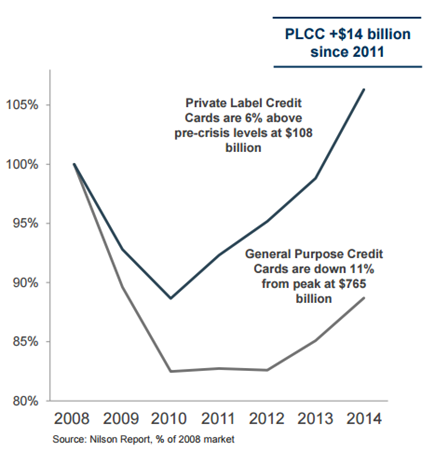 The traditional and related drawbacks of private-label credit are frictions in the enrolment process, limited utility (with some products such as a Brooks Brothers private label card able to be used at only a single merchant), and wallet-clutter. PayPal credit resolves these since, after a one-time enrolment and credit approval, the product can be used by any merchant that accepts PayPal. Furthermore, from the merchant standpoint, PayPal credit transactions can process in the same way as a Visa transaction since both are mediated by a PayPal token. We therefore view the distribution of PayPal tokens to offline merchants, via the partnership with First Data announced in January, as increasing the ability of PayPal to divert transactions from the branded card networks. Whether or not Visa responds to the threat from PayPal by reducing prices, bank revenue streams from the card business are at risk. As merchant-oriented solutions, such as PayPal and CurrentC, brand the consumer payments experience, merchants will increasingly shape customer preferences in favor of merchant-issued tender (aka private-label) over network-accessed bankcard tender. The trend is already evident in the share-gains made by private-label solutions in the card-lending market (Chart 2) and we expect it to accelerate. Part of the bank response has been to offer higher rewards not only to “transactor” customers (who pay-in-full at the end of each month) but also increasingly to those who carry a balance. These bankcard rewards are in turn funded by the “interchange” payments, made by a merchant to an issuing bank and amounting to ~1.5% of transaction value for most credit cards and over 2% on “premium” cards (such as Visa Signature and MasterCard World). As this interchange is increasingly used to support the bankcard lending businesses, “spend-centric” models such as the charge card business at American Express (where the economics are driven by payments volume and not loan balances are being squeezed); indeed, this accounts for the difficulties at AXP and the announcement last week that the firm would be shifting its economic mix in the US towards a more lend-centric model. The squeeze on the spend-driven economics of bankcard businesses will become more intense as consumers increasingly access credit through merchant-issued apps (whether or not these support network-branded cards) rather than bank-issued plastic. The reason is that, through loyalty programs and targeted real-time coupons, merchants will reward customers using private-label tender and integrate the earn-and-burn of loyalty-and-coupon benefits into the main payments stream. Indeed, this elimination of checkout friction is a key goal of the retailer consortium MCX whose CurrentC-branded app will allow the payment and coupon-redemption to occur, along with digital receipt-management, in a single “split-tender” wave of a phone as an alternative to the current checkout process where a consumer may need to produce a bankcard, a loyalty card, a paper coupon and, if there is a credit on a returned-item, the receipt from a prior transaction. Merchants have plenty of ammunition to fund loyalty-and-coupon benefits not only from the interchange savings when network-branded credit cards are not used but also from trade-spend as discussed above; the result is that, to compete, banks will need to offer more generous rewards to some customers to keep bank-issued product at the top-of-wallet. Obviously, this is not true for all customers, particularly those who aggregate spending on a single preferred card to collect airline miles, but it is true for the more coupon-sensitive segment of the market which tends to be more inclined to borrow on credit cards rather than pay-in-full each month. Regardless, the share-gains in card-lending by private-label will tend to increase the pressure on bankcard issuers, beyond those arising from interbank competition, to offer rewards and hence tighten the gap between bank interchange receipts and rewards costs. Of course, this tightening will accelerate to the extent Visa and MasterCard look to reduce the incentive for PayPal to steer to private-label credit by offering the firm volume-based discounts and hence lowering its funding rate. In practice, this will mean lowering the interchange rate paid by PayPal since interchange represents ~90% of the fees paid by merchants to the card networks with the fees paid to the network itself and to the “acquiring” bank representing the merchant on the network being the balance. It is important to recall that in agreeing lower interchange rates, Visa and MasterCard are degrading the economics of their bank-issuer customers and not directly their own economics since interchange is a pass through. The effect on banks is that their ability to compete against merchant-issued tender and the associated merchant-loyalty and coupon rewards is undermined. The threat from this negative flywheel – where Visa lowers interchange to discourage PayPal from steering-away so that banks are less able to compete with rewards against merchant-level coupon and loyalty benefits – is relatively minor today given PayPal has an 8% share of the eCommerce market which is ~10% of global retail sales. However, as PayPal looks to use the consumer shift to mobile phones to extend its franchise to the offline market, bank concern is increasing with the evidence showing up, of all places, in the market for person-to-person or P2P payments. For years, banks have steadfastly avoided improving the P2P experience so that even with mobile services such as PopMoney from FISV and People Money from FIS (provided to bank clients on white-label basis), settlement over the ACH network takes 2 to 3 days. Banks have not been able to make a traditional business case for offering customers the ability to transfer money in real-time and at no charge particularly given concerns about cannibalization of the wire transfer business and reducing the stickiness of deposit balances; as a result, banks have not supported investment in moving the ACH network to real-time settlement (although it is now moving towards same-day settlement for some transactions). PYPL has taken advantage of this market gap particularly among under-30 customers with its Venmo service allowing customers to send money instantly to anyone with a Venmo account (since both accounts are then maintained by PYPL and the transaction can be handled by book-transfer on PayPal’s ledger rather than needing interbank settlement). Venmo will probably handle $15bn of P2P payments in 2016 (up three times for a year ago) compared with $20bn and $22bn for BAC and JPM respectively in 2015. However, the real significance of Venmo is that, to monetize the customer base, PayPal has announced plans to extend the service to allow “pay-with-Venmo” through merchant apps first for online merchants but inevitably for offline merchants as well as payments is integrated into pay-and-save shopping apps. Even though Venmo accounts may ultimately be funded by bankcards, these are for the time being typically debit cards (carrying low and regulated interchange) not credit cards and PayPal can encourage consumers to fund Venmo accounts with ACH debit and PayPal credit as it does for PayPal accounts. In other words, the P2P market has become a control-point for the customer relationship and another avenue through which PayPal can disintermediate the branded card networks and banks from point-of-sale payments. Given this strategic relevance, banks have overcome their reluctance to enable real-time P2P transfers and the seven largest except C (so BAC, JPM, WFC, USB, COF, BBT, and PNC) are partners in the clearXchange (CX) P2P payments network with BAC and USB announcing earlier this month that they have gone live on the network. CX achieves instant settlement through collaboration among the banks on a book-ledger and willingness among the banks to honor balances on the CX ledger ahead of final settlement through the Federal Reserve System (which is not real-time). It is notable that these banks chose not to launch on an upgraded ACH network since ACH, unlike CX, is accessible by PayPal. We expect CX to extend its reach to community banks and credit unions through interoperability with the P2P networks of FIS and FISV. We also expect CX to be extended over time to point-of-sale payments hence representing competition to Visa and MasterCard and a means for banks to regain control of the payments value chain (so far achieved only by JPM, and then only in part, through its ChaseNet network). PYPL exists in its current form largely because of a change in the rule-set of the branded networks in 2001 allowing e-commerce merchants to accept payment cards as if they were affiliates of PayPal rather than stand-alone entities; this relieved small e-commerce merchants of the costs and risks of establishing acquiring accounts in their own names and of certifying compliance with payment card industry (PCI) standards; the only requirement to accept card payments was that merchants installed the PayPal buy-button on their web-sites. As they are today (with the argument that globally only 15% of payments are card-based), the networks focused on developing the primary market for their services and took the view that PayPal could lift consumer use of payment cards for e-commerce transactions by reducing friction and, in particular, by eliminating the need for consumes to enter card numbers for each merchant web-site on which they made a purchase. Under the same logic, Visa and MasterCard extended the so-called “aggregator” rules to offline merchants in 2006 and enabled the extension of PYPL’s model offline (as well as creating the conditions for Square to emerge).